Remember that Chinese motorist who smashed his own $428,000 Maserati Quattroporte to bits with sledge hammers in protest of his dealer’s shoddy service? It's happened again. Remember that Chinese motorist who smashed his own $428,000 Maserati Quattroporte to bits with sledge hammers in protest of his dealer’s shoddy service? Well, it’s happened again – sort of. 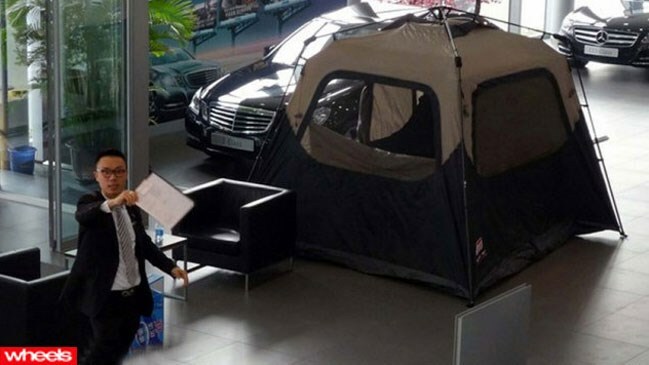 Another Chinese motorists has staged a very public protest, this time by pitching a tent in the middle of his dealer’s showroom. Reportedly tired of being told to ‘come back tomorrow’ by staff at a Mercedes dealership in Beijing, My Yao Feng, 48, pitched a tent and refused to move until his issue was resolved. Mr Feng had purchased a Mercedes-Benz B200, but soon hit mechanical problems. After telling his dealer of the issues, Mr Feng was reportedly told to ‘come back the next day’ over 20 times. “I was very proud to be the only person in my village to own a Mercedes-Benz,” said Mr Feng.